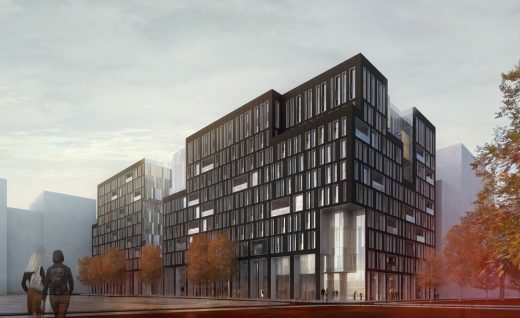 King’s Cross Limited Partnership (KCCLP) has been granted planning permission by Camden Council for a new 11-storey office building designed by Mossessian Architecture. The building, known as S1, forms an architectural pair with neighbouring S2, which was also designed by Mossessian Architecture and is home to Google. Both are located on the new Handyside Street, by Lewis Cubitt Park. Mossessian Architecture has won a competition to design Saudi Arabia’s Makkah Museum, a building dedicated to the Islamic faith. It will occupy a site seven kilometres from the Grand Mosque, in Makkah, which houses the Kaaba – the most sacred location in the world for Muslims. mossessian & partners’ design for Qatari developer Dohaland wins two AR Future Projects awards for groundbreaking downtown regeneration in Doha. mossessian & partners will receive two awards at Mipim this year for Al Barahat Square, a new civic space in Doha, Qatar and the centrepiece of Qatari developer Dohaland’s $5.5 billion (QAR 20 bn) ‘Musheireb’ development. 2 Mar 2011 – 5 Merchant Square by mossessian & partners has been nominated for the Country of Honour award, selected from a shortlist of over 100 entries from 27 countries. It is located facing south over the canal in Paddington, west London, one of Europe’s largest regeneration sites. Carmine: Commercial office with ground floor retail and a health club at ground and basement level. Above ground area approx. 355,000 sqft. Six buildings – three office and three residential. mossessian & partners is an international studio for architecture, planning, technology and design. Established in 2005 by former SOM London Design Director Michel Mossessian, Michel and his team are committed to architecture that adds cultural value and benefits society ‘beyond buildings’. Following twenty years’ design experience on major projects in Chicago, New York, Paris, and London, including leading the design team that won the competition for the new NATO headquarters in Brussels, Michel Mossessian chose to establish his independent practice in London to focus on the demands of complex, high density urban spaces. mossessian & partners has a growing reputation for architecture of the highest calibre. Rejecting an ‘ivory tower’ design mentality, the practice encourages a design process that is entirely collaborative, alert to the needs of clients and attentive to the requirements of local planning authorities. 2010 saw the completion of three mossessian & partners buildings: 5 Merchant Square in Paddington, London (nominated for a ‘Country of Honour’ award at MIPIM 2011); ExxonMobil Headquarters in Shanghai and a private residence in Sorede, France. The practice is currently working in Doha, Qatar on Al Barahat Square, a 65,000m2 civic space comprising nine mixed-use, residential, commercial and retail buildings around a major public square at the heart of “Musheireb”. The latter is a 31 hectare development, the world’s first sustainable downtown regeneration scheme. Al Barahat Square was awarded an Architectural Review Future Project Award at MIPIM 2011. mossessian & partners is appointed to work on further phases of Musheireb, including creating two office buildings over 13,000 m2 of space for Phase 2. Michel Mossessian is a world-class designer who has consistently been at the forefront of new approaches to design, sustainable architecture and new building technologies. After graduating in architecture from Ecole Nationale Supérieure d’Architecture de Paris Belleville, and studying philosophy with Jacques Derrida and Michel Foucault, Michel was invited to be a Villa Medicis Hors les Murs fellow at the Cooper Union School of Architecture, NY, where he studied Advanced Design, before going on to complete his masters in Design Studies at Harvard Graduate School of Design. He was personally mentored by Bruce Graham, at SOM Chicago, before becoming Design Director at SOM London. His design leadership led to successes at the highest international level in projects in the UK, Europe and the Middle East, culminating in his winning design for the new NATO headquarters in Brussels (due to complete 2015).